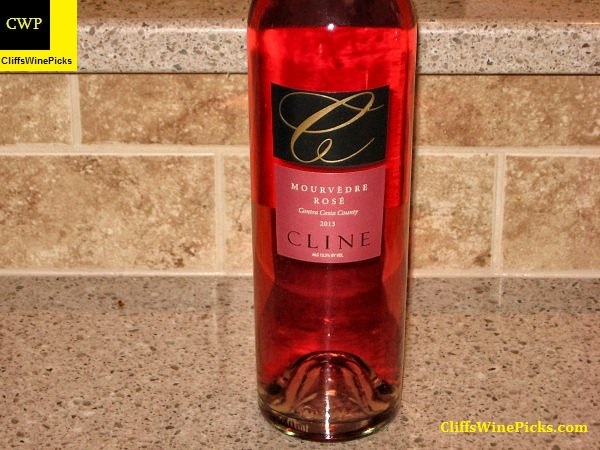 Cline was the guest of honor for the Twitter based #winechat on April 30th. I was lucky to be sent the three bottles we will be discussing during the event. 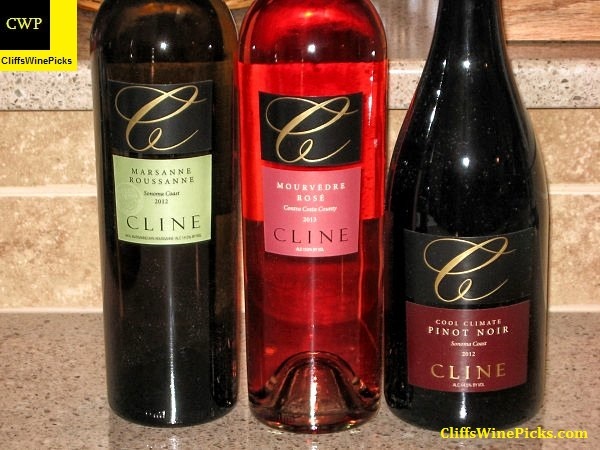 I’ve been a fan of the wines made by Cline for a number of years. Their wines are generally very reasonably priced and they have great distribution around the country. This wine is a blend of 66% Marsanne and 34% Roussanne. The Marsanne comes from Cline’s estate vineyard in Sonoma Carneros, the Roussanne comes from their Sonoma Coast vineyard. The grapes were hand-picked and destemmed. After pressing in a tank press the juice is pumped into a settling tank and chilled at 55 degrees. The next day the juice is racked to another tank and fermented. This wine does not receive any oak aging to preserve the fresh and lively fruit character. This wine is not distributed. It is only available at the winery or via their website. The wine has 14.5% alcohol by volume. This wine is made from 100% Mourvedre grapes from the winery’s Oakley vineyard in Contra Costa County. The vines in this vineyard are over a century old. This wine is made as a Blanc de Noir or “white of a red grape” in style. Just after fermentation begins, the wine is pressed to remove the skins. A small amount of color, flavor and astringent tannins are retained in the juice. The juice is fermented slowly at a cold temperature to preserve the bright fruit flavors. Fermentation is halted just before the wine is fully dry to add a touch of sweetness. The wine has 13.5% alcohol by volume and there is .81% residual sugar. This 100% Pinot Noir uses grapes from the estate’s vineyards in the Sonoma Coast appellation. 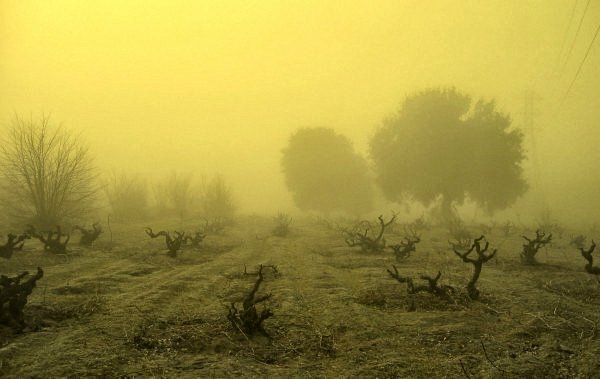 This region is often covered by coastal fog which helps mitigate daytime heat during the growing season. For this wine, the grapes are hand harvested, destemmed and pumped directly into stainless steel fermentation tanks. The wine is pumped over the cap of grape solids three times a day to help extract additional flavor and color. After fermentation completes, the wine is pressed off the solids and moved into settling tanks. After settling, the wine is racked into 35% new French oak barrels for 9 months of aging. 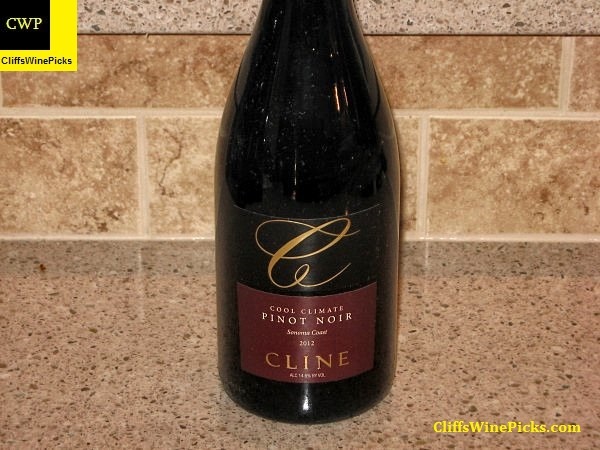 Cline always offers wines that are tasty and value priced. 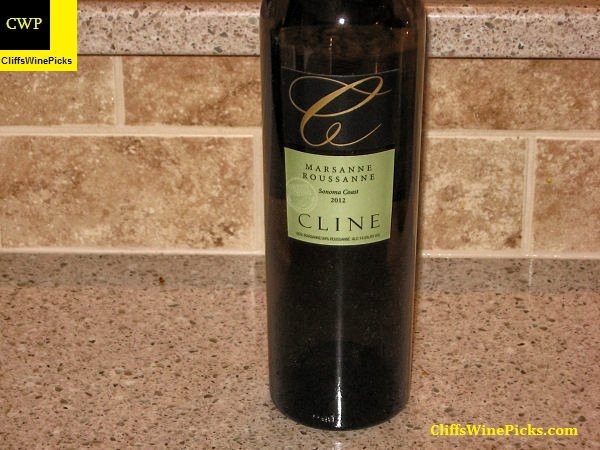 Any time you grab a bottle with Cline on the label you are guaranteed to not be disappointed.